This is one of my favorite shots. It can be a bit disorienting at first. 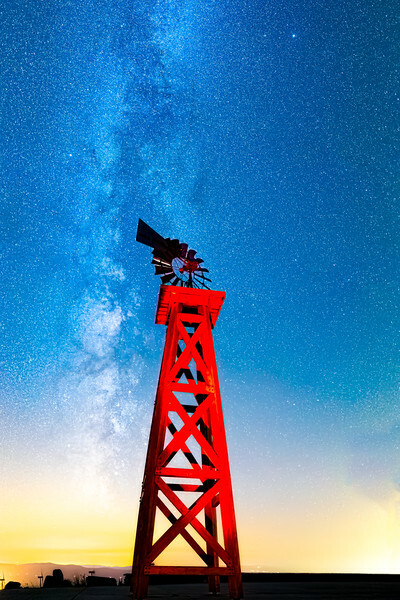 On the bottom, you see an old school windmill, on the southern horizon, on the top you see the northern horizon, with a modern wind turbine, and the Milky Way stretches between them. The wind turbine on top looks smaller because it's farther away. This is a panoramic image, so it has the pixels to be printed HUGE. If you're looking at it on a large monitor, it may appear pixelated, but that's just because the preview image is being stretched to many times its size. If you want to print this 50' tall, contact me. I'm serious, it'll go that big. This is a shorter version of the full image. This shape allows it to be printed in more traditional sizes and aspect ratios.